More information: After several name changes, Jethro Tull played its first show as Jethro Tull in February 1968. 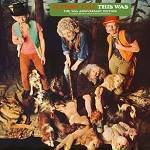 Months later, Ian Anderson, Mick Abrahams, Glenn Cornick and Clive Bunker released the band’s debut – This Was. The album debuted at #10 on the U.K. album chart, but more important, it was the first step in a 50-year (and counting) journey that made Jethro Tull one of the world’s most successful progressive rock bands.